Today at its media event in Cupertino, Apple announced a brand-new Mac mini, a popular Mac computer that hadn't been updated since October 2012. The new Mac mini starts at $499, $100 less than the previous $599 starting price. The new Mac mini comes with 4th-generation Intel Core processors, Intel Iris and HD Graphics 5000 with up to 90 percent faster graphics than the previous generation, PCIe-based flash storage, 802.11ac Wi-Fi, and two Thunderbolt 2 ports. Apple also claims it's the "world's most efficient desktop". The new Mac mini begins shipping today. It was the last Mac with Firewire. What did you expect? RS232 ports and a Floppy drive also? Then don't purchase the base model ?? We all can't have top end specs at rock bottom pricing, sure you want that, hell so do I but it has never happened and it won't start today. We all have to pay to play on better, faster equipment. WTH Apple?? No quad core anymore?? That's really lame. 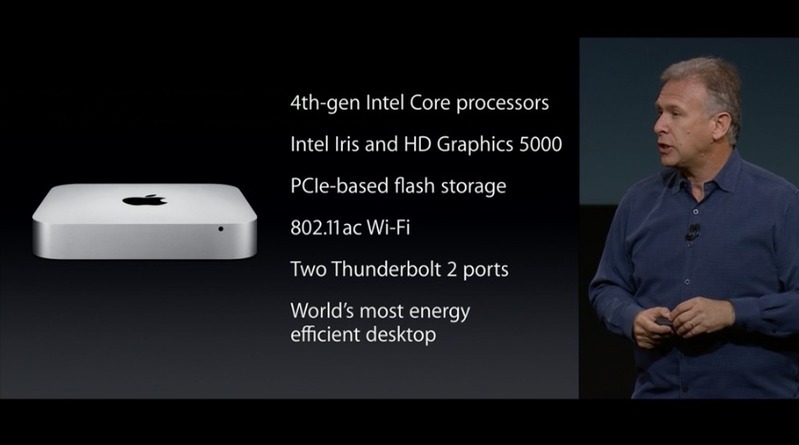 We waited 2 years for you to cripple the Mac Mini with a dual core? Just been on livechat as I saw this in the order page. "Configurable to 8GB or 16GB, only at the Apple Online Store." The i7 is a dual-core. Disappointing. I was finally going to get rid of my Windows server but I need the quad-core. Oh well. No idea, I don't buy Mac Minis. Then what are you doing in a Mac mini thread? And looks like you are wrong, how unsurprising. yeah, you're right. he actually gave apple too much credit by assuming they'd put an SSD in the low-end machine. 1.4ghz and a 5400rpm drive? what is this, 2005?